Lebello is pleased to announce the launch of our material e-store, a single material library platform that enables our customers to place sample orders for any of the materials in the Forever Summer Collection. 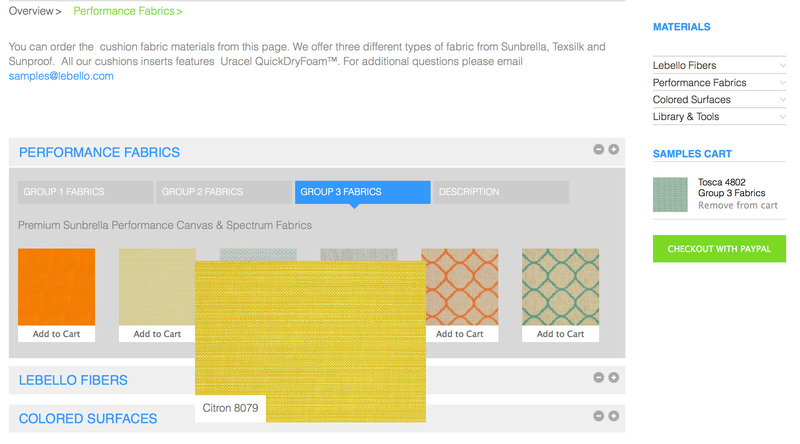 In addition to the Lebello core and peel fiber materials, customers will be able to select outdoor performance fabric swatches from the three different material groups. Surface materials provide powder-coat frame color samples, table tops and seat surface materials like teak wood and (CL) compact lamination. Lebello will ship material samples worldwide. Special request for next day delivery can be arrange upon prior request and availability. Please contact sales@lebello.com for further information.